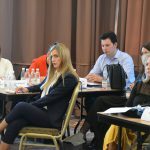 The first module of the fifth generation of the Academy of Equality – Platform for Political Leadership and Joint Action of the Representative, leaders of political parties and civil society organizations, was held in Sarajevo from 15 to 17 March, organized by the Friedrich Ebert Foundation and the Sarajevo Open Centre. The first module, which consisted of lectures, workshops and discussions, focused on gender equality policies. Moderator of the module was journalist Duška Jurišić, and the participants had the opportunity to listen to prominent lecturers from the field of gender equality from Serbia and Bosnia and Herzegovina. The other two modules of the Equality Academy will be held on Jahorina from April 12 to April 14 and in Neum from May 10 to May 12, 2019. The Equality Academy aims to strengthen the capacity of leaders in the field of gender equality and the equality policy of disadvantaged groups in B&H in order to improve the rights of citizens of Bosnia and Herzegovina. In addition, the Academy aims to strengthen cooperation between donors of decisions and representatives of civil society organizations in B&H.